Things would eventually change, however, as Muhlestein explains that “after some time I felt I needed to learn at least a little bit about the Book of Abraham because so many people asked me questions. After having given some wrong answers to some questions, I decided to really get into some of the Egyptological aspects of it so that I could correct my own mistakes.” This area of study has proven fruitful, as Muhlestein has published several articles on the Book of Abraham and the Joseph Smith Papyri, including: “The Book of Breathings in Its Place,” “Approaching Understandings in the Book of Abraham,” “Egyptian Papyri and the Book of Abraham: Some Questions and Answers,” “An Egyptian Context for the Sacrifice of Abraham” and “The Religious and Cultural Background of Joseph Smith Papyrus I.” A new CD series, “Understanding the Book of Abraham,” aimed at a general LDS audience was just released last month by Muhlestein. In an interview with the Student Review, Muhlestein shared some of his thoughts on the Book of Abraham and the attending scholarly issues currently being investigated by him and other scholars. 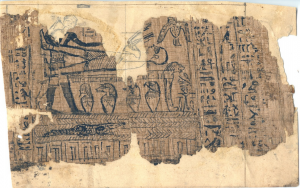 Student Review (SR): How did Joseph Smith receive the Egyptian papyri he translated? Kerry Muhlestein: Joseph Smith purchased the papyri from Michael Chandler, who brought them to Kirtland, Ohio in 1835. Chandler came because he knew of the Prophet’s interest in ancient languages. Chandler was showing the mummies and papyri in a traveling show, but had begun selling the collection a bit at a time. SR: How did Joseph Smith translate these papyri? Muhlestein: We do not know the exact process by which Joseph Smith translated the Book of Abraham, besides that it was done by the power of God. There is some evidence that suggests he used the Urim and Thummim, or possibly his seer stone. It is not completely clear whether he was actually translating from the papyri, something akin to how he translated the golden plates of the Book of Mormon, or if he was translating by receiving pure revelation, as he did with the Joseph Smith Translation of the Bible, or if there was a combination of these two methods, or even something else entirely. We just don’t have enough information. SR: When was the Book of Abraham published? Muhlestein: The Book of Abraham was first published in three installments in March and May 1842 in the Church’s newspaper Times and Seasons. SR: What happened to the papyri after Joseph Smith’s death? How did the Church recover them in the 1960s? Muhlestein: Lucy Mack Smith cared for the papyri and mummies after Joseph Smith died. When she passed away, Emma and her new husband quickly sold them to a man named Abel Combs. Combs sold them to a museum, and eventually they ended up in a museum in Chicago. The museum burned in the Great Chicago Fire in 1871, and it turns out that mummies and papyri burn exceptionally well! All of Joseph Smith’s former Egyptian collection that was in the museum was lost forever. For a long time we thought that was the whole collection. But it turned out that Combs had given a small portion of the papyri–––the fragments that had been mounted on paper and framed–––to his housekeeper. Her descendants eventually sold them to the Metropolitan Museum in New York. The curators recognized the drawing that was the source of Facsimile 1, and knew they were something of interest to the Church. They waited for the right time to make a connection with the Church, which finally came in 1967 when a visiting scholar from the University of Utah did some research at the museum. He arranged for a meeting with Church leaders, at which the museum gave the papyri to the Church, which has maintained possession of these few fragments ever since. SR: Where do the Joseph Smith Papyri come from? Who owned them anciently? How were they discovered? Muhlestein: While most of the papyri Joseph Smith owned were destroyed in the Great Chicago Fire, a few fragments survived. These are the only fragments about which we know anything. Some Egyptians who lived in Thebes around 200 BC owned these papyri anciently. One of them was an important priest by the name of Hor. An Italian explorer named Antonio Lebolo excavated the papyri probably in the early 1820s. Upon Lebolo’s death a small collection that included the papyri was sold in New York, and eventually ended up in the care of Michael Chandler, who sold them to Joseph Smith. SR: Do the Joseph Smith Papyri date to the time of Abraham? Muhlestein: The fragments we have date nearly 2000 years later than Abraham. Thus, if the source of the Book of Abraham is some of the papyri Joseph Smith owned, and if that papyrus dates to the same time period as the fragments we now have, then that papyrus would be a transmitted copy of the original that was written by Abraham. This would make it just like the sources we have for the Old and New Testaments, which are translations of copies of copies of original documents. SR: Do any of the surviving Joseph Smith Papyri contain the Book of Abraham? Muhlestein: When we translate the papyri fragments we now have they turn out to be Egyptian funerary texts. SR: Did the ancient Egyptians ever have any interest in Abraham? Muhlestein: Starting at least by 200–150 BC there were many Egyptians who were interested in Abraham. In particular, we know that a group of priests were collecting stories from other religious traditions and using those stories in their own religious spells. We know that some of them had specifically collected stories about Abraham and Moses. At least some of those who were doing this were priests from Thebes. This is most interesting because Joseph Smith Papyrus I, X, and XI were owned by the priest Hor from Thebes from the same time period. SR: What can you say about the so-called “Kirtland Egyptian Papers” or the Egyptian Alphabet and Grammar documents? Muhlestein: I do not think anyone really understands what the Egyptian Alphabet and Grammar documents are. W. W. Phelps did almost all of it, though one page is in the handwriting of Joseph Smith. My best guess would be that these documents represent an attempt by Joseph Smith and others interested in ancient languages to try to decipher Egyptian using their own abilities and ideas, perhaps basing this on some of the translation of the Book of Abraham the Prophet had done through inspiration. It is pretty clear, based on the historical evidence, that they soon gave up on this and instead pursued learning Hebrew, eventually hiring a Hebrew teacher. In the end, we really don’t know what they were trying to do when they created the documents called the Egyptian Alphabet and Grammar. SR: Do Joseph Smith’s interpretations of the facsimiles that accompany the Book of Abraham match the interpretations of Egyptologists? Muhlestein: There are aspects of Joseph Smith’s interpretations of the facsimiles that match what Egyptologists say they mean. Some aspects are quite compelling, especially for Facsimile 1. However, as we look at the entirety of any of the facsimiles, an Egyptological interpretation does not match what Joseph Smith said about them. That being said, we do not know to what we really should compare the facsimiles. Was Joseph Smith giving us an interpretation that ancient Egyptians would have held, or one that only a small group of priests interested in Abraham would have held, or one that a group of ancient Jews in Egypt would have held, or something another group altogether would have held, or was he giving us an interpretation we needed to receive for our spiritual benefit regardless of how any ancient groups would have seen these? We do not know. While I can make a pretty good case for the idea that some Egyptians could have viewed Facsimile 1 the way Joseph Smith presents it, I am not sure that is the methodology we should be employing. We just don’t know enough about what Joseph Smith was doing to be sure about any possible comparisons, or lack thereof. SR: Does the Book of Abraham have any evidence for ancient origins? Muhlestein: There are many interesting little evidences that support the idea that the Book of Abraham is an ancient document. For example, the text speaks of Jershon, and names it as lying along a route where an ancient city now known as Jerash lies. The likelihood that Joseph Smith would make up a name that has such a wonderful linguistic match in exactly the right place is pretty small. Similarly, the Book of Abraham speaks of an Olishem. Ancient texts have since revealed the name of a place called “Ulishem” that existed during Abraham’s day. As time goes on we learn more and more of this Ulishem and its geographic location works very well with the story told in the text of the Book of Abraham. Again, the chances that Joseph Smith could make up the right name in the right place are very small, but doing it twice is even less likely. There are other similar things that suggest an ancient origin for the text. SR: What do you think are some legitimate criticisms against the Book of Abraham? How would you respond to them? Muhlestein: I would say that, to my knowledge, all the criticisms that seem legitimate are based on assumptions that people usually don’t even know they have, and that these assumptions prove to be problematic when we examine them. We have to be careful about what we assume about Joseph Smith’s translation process, what the source of the Book of Abraham was, etc. SR: Some scholars have argued that we’re missing a substantial portion of the Joseph Smith Papyri. Others deny this, and say we’re only missing a few scraps. How much of the Joseph Smith Papyri do you think are we’re missing, and why is that significant? Muhlestein: The historical documents make it clear that we have very little of the papyri Joseph Smith had. Even after several fragments were mounted to paper and put under glass (presumably this is what we have now), the eyewitnesses say that there was a large roll and another roll (smaller, but presumably still sizable) of papyri. This means that the largest portion of the papyrus collection is not the fragments that we now have, but rather has been lost. SR: What doctrinal benefits or insights do Church members gain from the Book of Abraham? Muhlestein: In the Book of Abraham we learn significant things about Abraham, about the Abrahamic Covenant, about the nature of mankind and our pre-mortal existence and about our relationship with God. That is pretty significant information for a few pages of text. In many ways it is a profound and very inspiring book. SR: What would you say to those who might be going through a crisis of faith because of arguments they read against the Book of Abraham? Muhlestein: I would say that they should be careful about what they believe, they should be careful of the assumptions that they make, but especially they should be careful not to value theories and assumptions of man more than they value information they can learn from revelation. I am fully certain that most of the things people are so concerned about now will one day be shown to be based on mistakes. The academic process is built on trying to correct the faulty ideas we currently have. However, revelation is a different process, one that does not put forward ideas today that will be overturned tomorrow. I urge you to question the bad assumptions found in my ideas and everyone else’s. As you do so, remember that revelation gives you access to a source of knowledge that is neither faulty nor given to bad assumptions. Knowing the flaws of the academic process I choose to value revelation as a source of knowledge we can trust in more.